Ugliest: Danielle DeMarco, also known as Dan the Man. Prettiest: Abby Warner, bonus points awarded for overcoming family genetics! Ugliest: Candace Kincaid, beauty isn't just skin-deep, btw. Prettiest: Lauren Finn, everyone's hot for the new girl. Ugliest: Sarah Singer, it's like she’s trying to be as ugly as possible. Prettiest: Bridget Honeycutt, what a difference a summer can make. Ugliest: Jennifer Briggs, (drumroll, please) The only four-peat in Mount Washington history! Congrats, Jennifer! Prettiest: Margo Gable, all hail this year’s homecoming queen!" The novel follows the lives of these eight girls in the week leading up to the Homecoming Dance and depicts the impact the stamp of "pretty" and "ugly" has on each of them, their friends, peers and families. From the new girl becoming popular overnight to the taunts following another deemed ugly. Author Siobhan Vivian has created an original concept to show some of the problems facing high school girls nowadays and the unfortunate misconception that they have as to what's pretty, what isn't and that being "pretty" is defining as to who they are. How others perceive them breaks their self-esteem and because of this the girls on the list face problems such as anorexia and bullying. Unfortunately the book's fantastic premise and its realistic and interesting characters are ultimately forgotten after the reader hits the highly unsatisfying ending. The conclusion seems very abrupt and leaves several storylines open amounting to a lot of questions (Will Jeniffer keep her promise? What will happen to Lauren? And Bridget? To name a few). Furthermore, the final sentence is such an overused stereotype - the one thing Vivian was trying to fight against by showing the girls are vastly different from the stereotypes they were labeled as - that it leaves a feeling of disappointment. 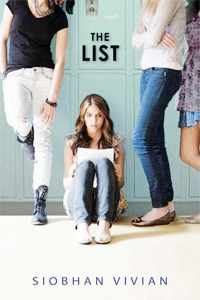 The List would be 5 star novel were it not for that final page.